The main change from our last visit in December is doors for the bathroom but no picture as we forgot our cameras. 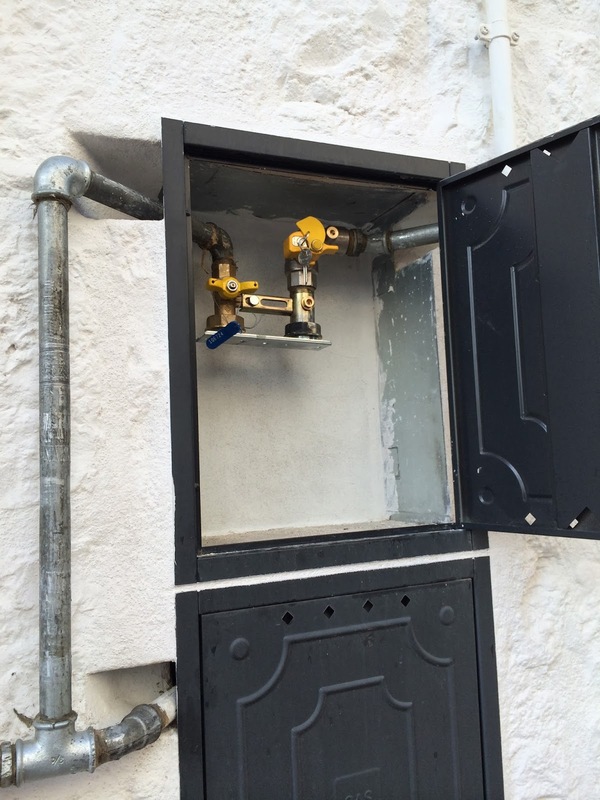 The main change should have been gas central heating but the Italian bureaucracy has been grinding along since September and still failed to deliver approval of the connection of town gas. We are all plumbed and ready to go. Also storage in Sotto Le Stelle is at a premium - basically there isn't any. We need to maximise use of every niche. So we asked our builder to install glass shelves in the niche behind the sink and the niche in the valley wall. They looked good and add storage capacity. 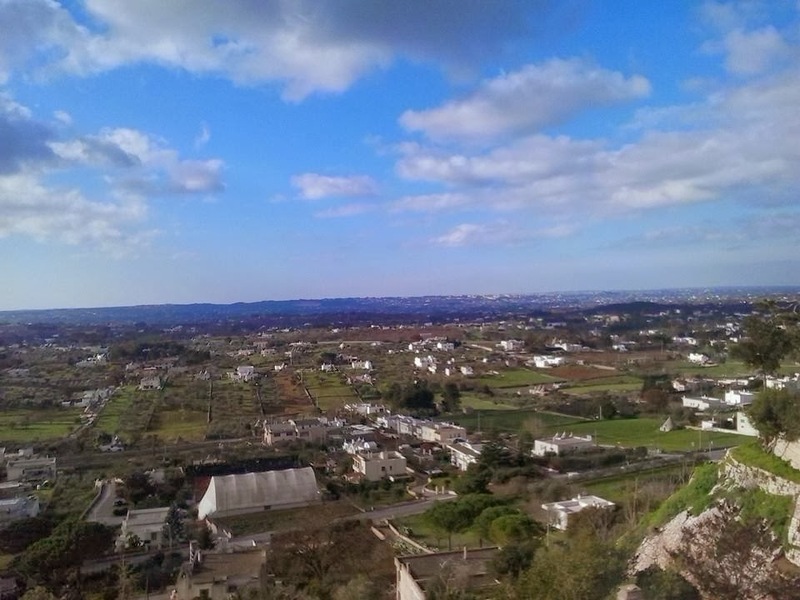 Cisternino in January is pretty quiet. Many of the restaurants were closed even on a Saturday night, some of them for an off season holiday. We wandered around on our arrival Saturday night looking for food and settled on Le Tre Lanterne in the main square (Piazza V. Emanuel). For years Bar Fod was the only bar in the main square. Then a young upstart rival bar cafe appeared. Now it has gone and is replaced by Le Tre Lanterne, a "fornello pronto" - lit. "speedy oven" - basically a butcher that cooks meat for you. Le Tre Lanterne was more like a proper restaurant but we're not complaining. I had some excellent wild boar sausages with a half bottle of local Primitivo. The next day was lovely and sunny. As it was Mary's birthday we ate and drank - celebration was a four hour lunch at Osteria La Valle. It was so typically Italian at the next table: a multi-generational group of about twenty family and friends chatting, hand-waving, greeting friends who dropped in to say hello. Love it. The space under the basin now has a towel rail and hooks for a curtain. We have commissioned a glass shelf to go in there. The alcove beside our bed acquired a hanging rail, an assembled, flat-pack chest of draws and a curtain rail to cover it all. The old toilet niche would have have a cheap set of wooden shelving in but the dimensions lied - the shelves were 0.5 cm too wide! Wednesday's activities included sawing one end of each of the shelves ready for assembly next visit. 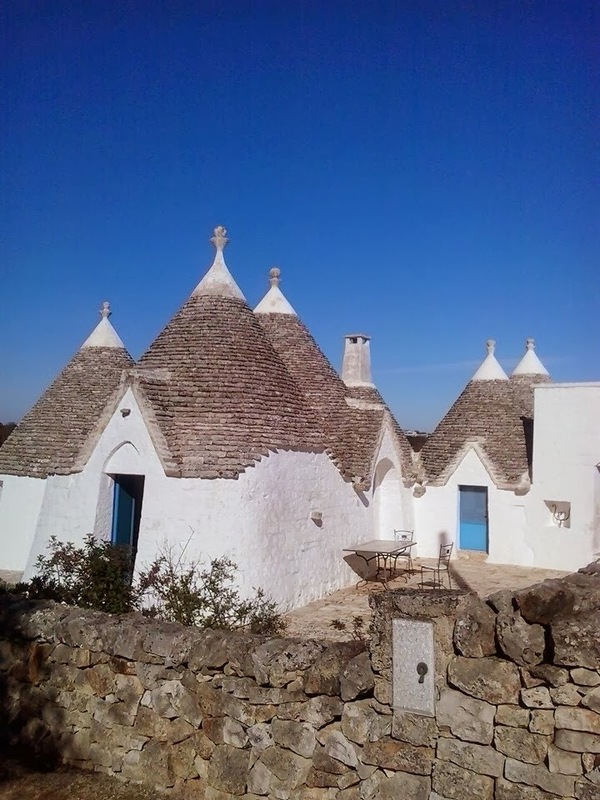 We bought a set of sliding shelves to go under the kitchen sink but they would not fit so they are now installed in Trullo Azzurro. Next time we will check the depth as well as the width.